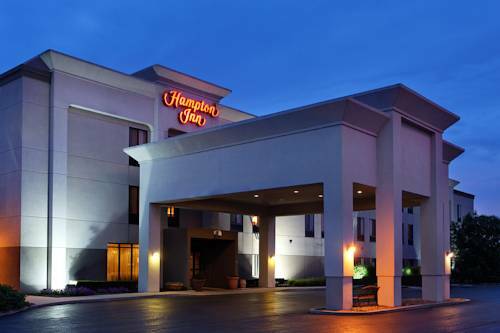 The Hampton Inn Ottawa hotel in Illinois is located .5 miles from I-80 3 miles from downtown Ottawa and the airport and 15 miles from Starved Rock State Park. In Illinois area attractions include golf courses state parks and the Illinois Waterway Visitors Center 10 miles east of the hotel. We are also located 17 miles from the Hilton Reservation Center in Streator IL. The Chicagoland Speedway in Joliet is 43 miles away from our Ottawa Illinois hotel. Dining options around Ottawa Illinois include Cracker Barrel Taco Bell Subway and Shaker*s Sports Bar all nearby the Hampton Inn Ottawa hotel. The Hampton Inn Ottawa hotel features 64 rooms including whirlpool suites a business center secretarial service elevator exercise gym indoor pool and spa and meeting space for up to 45 people. Hotel amenities include complimentary continental breakfast newspaper in-room coffeemaker and hair dryer voicemail and TV with cable. The Hampton Inn also offers connecting rooms cribs express checkout iron whirlpool and refrigerators. Guest laundromat and laundry/valet services are available for a nominal fee. We love having you here at the Hampton Inn Ottawa hotel in Illinois.